The easiest way to explain Monument Valley to people is to say it's a bit like an interactive M.C. Escher artwork. 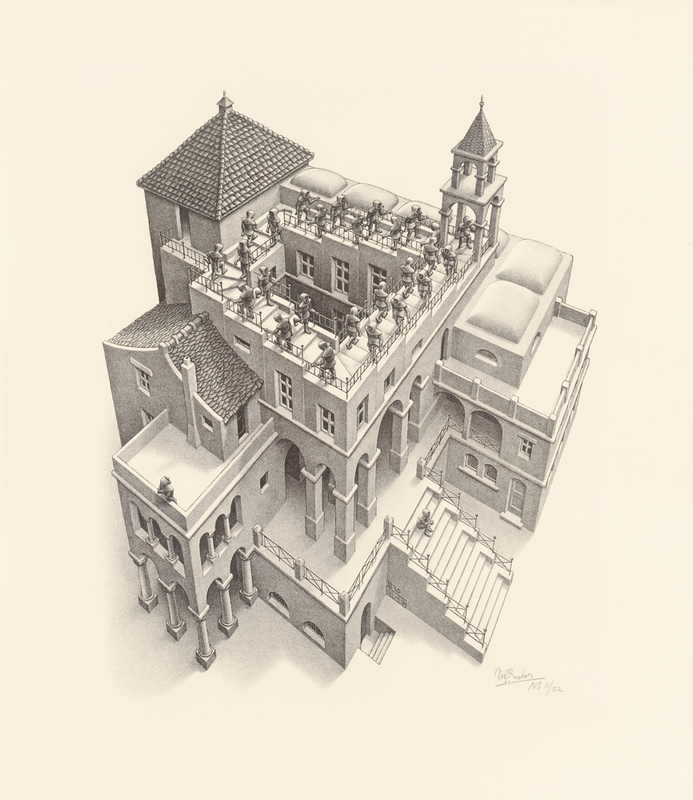 While the game as it now stands draws inspiration from many artists, films and photographs, Escher played a key role in finding what the game was about. For a few years I've thought about how one might design a game where the architecture was the central character. I'm particularly fond of temples, palaces, mosques, monasteries and other buildings which combine exquisite artistry with a potential for exploration and mystery. The main problem was how to make an interactive experience out of this. Then one day I came across Ascending and Descending, an image I was familiar with but had never looked at from the perspective of game design. What if you had to guide a figure to enter the building, solve some puzzles hidden in the interior rooms, with the goal of getting to the highest tower? Rather than following the character with a first-person or third-person camera, we could keep the emphasis on the environment by retaining the bird's eye view and this enclosed framing that Escher had used. This concept (which is, in a way, Zelda meets Myst) was the implementation I had been searching for for my architectural game, and became the basis of Monument Valley.